Blowout Sale! Free Shipping Included! Save 56% on the Apple Watch Stand Aluminum Apple Watch Charging Stand AirPods Stand Charging Docks Holder for Apple Watch Series 3/2/1/ AirPods/iPhone X/8/8Plus/7/7 Plus /6S /6S Plus/iPad-Black by OLEBR at Kode Fu Guru. MPN: OB008SG-USA001. Hurry! Limited time offer. Offer valid only while supplies last. 【Decent iPhone Charging Stand】 Convenient to charge your iPhone in position with or whitout case(Need to install your original apple lightning cable).Vertical iPhone charging station allows viewing angle for facetime.- sturdy, neatly and orginazed. Looks good and elegant, perfectly decorates your bedroom, study, hall, office desk. 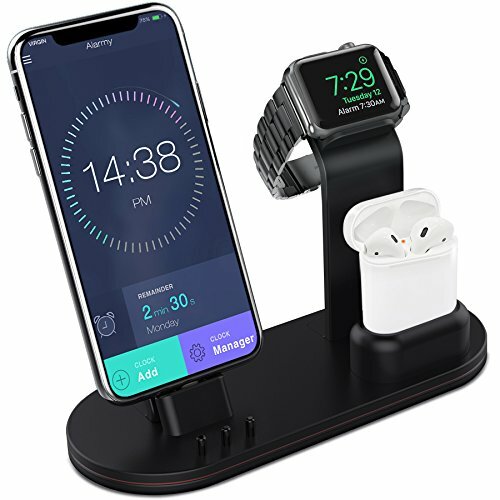 【Specialized Silicone Apple Watch Holder】Steadily holds your Apple Watch 45°angel supports Nightstand Mode.The specialized silicone iwatch holder just hold your watch safely,Prevent from falling off and Scratching. Fit for both the 38mm and 42mm models of your Apple Watch Series 1, Apple Watch Series 2 and Apple Watch Series 3. ATTN: Apple Watch magnetic charger or watch are NOT INCLUDED. 【Solid Dock for Airpods】Specially designed as an Airpods Accessories, avoids your Airpods missing.Constructed of premium aluminum alloy with refined polishing, perfectly finished for a solid build and smooth surface. The non-slip pad on the bottom enhances the stability of the whole unit. 【Convenient and Easy Apple Watch Stand】A finger comfortable metal nut is designed to make it works just fine with or without a thin case, which means you do not have to take the case off when charging your iPhone. The exquisite protrusion in front of the iPhone holder acts as a stand for watching movies or other entertainments. Big convenience for your life. 【Compatibility】Universal for Apple Watch Series 3/ Series 2/ Series 1/ Nike+ / Sport / Edition / 38mm/ 42mm; Apple Airpods, iPhone X / 8 /8 Plus, iPhone 7 / 7 Plus, iPhone 6 / 6s Plus / SE / 5S / 5C / 5/ iPad 7.9ect. Please feel free to contact us for any question, our professional customer service team will reply all email within 10 hours.